Witchcraft has its own set of "tools" or magical objects that are often employed during spells and rituals, including brooms/besom, wands, athames, chalices, etc, to enhance the magic performed. 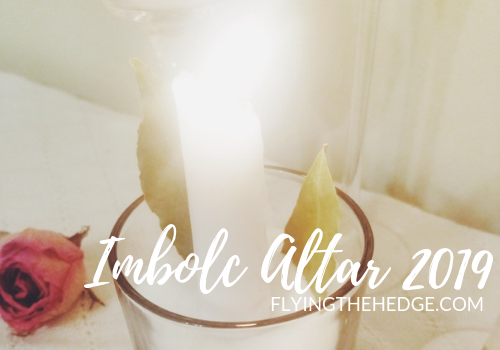 Lists of these tools are found in every book on witchcraft or Wicca, a flood of blog posts, and a large number of Pinterest boards. However, there are many tools witches often use that are not talked about. 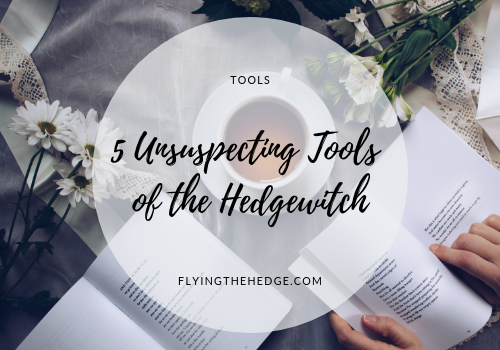 Here are 5 unsuspecting or little talked about tools of the hedgewitch, tools I commonly use every day in my practice. 1. Poetry. This is a pretty big one for me. First, poetry offers us melodic ways to cast our spells. 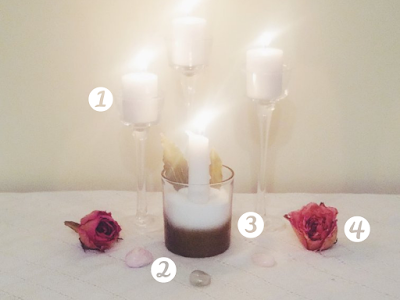 They teach us how to organize and memorize spells in an easy yet beautiful format. Poetry is extremely easy to memorize, just like a song, which is why so many witches create rhyming spells or spells with iambic pentameter. 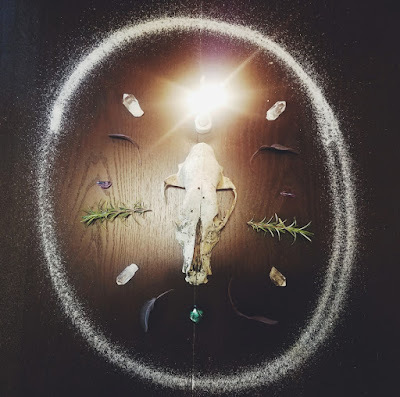 You don't always want to carry your Grimoire or BOS into a ritual and it's much more powerful to have a spell memorized so you can speak it with conviction during your spell or ritual. Furthermore, poetry offers us some amazing magical correspondences. For example, my favorite poem is The Poison Tree by William Blake. Because of this poem, I associate apples with revenge and death. Another favorite of mine is The Rime of the Ancient Mariner by Samuel Taylor Coleridge. For me, the albatross represents innocence, patience, and purity. The Raven by Edgar Allen Poe is also a favorite of mine and as a result, I associate ravens with death, remorse, and lost love. Whatever the poem, you're going to find some pretty powerful correspondences that speak to you as well as an understanding of how to construct your spells if you use and read poetry. 2. Science. This may seem out of place for some of you. How in the world can magic and science coexist? Thankfully, the Hermetic Principles do a pretty good job of explaining the connection between science and magic, which has been covered numerous times, including by myself. Either way, magic works within the confines of our physical world, so understanding physics and chemistry will give you a pretty good understanding of energy, motion, and ingredient reactions. You construct better spells and perform stronger magic when you grasp scientific principles. Furthermore, science offers us a slew of correspondences. Garlic, for example, is well known in the medical community for being antibacterial and antiviral. In the magical community, we associate this with protection because garlic literally protects you from infections! 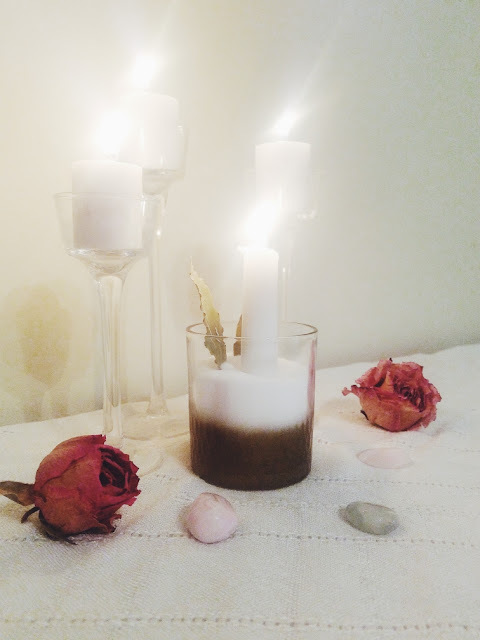 Water is a know purifier, hence why we associate it with purification and renewal, while certain flowers are the first to grow in spring, making them associated with rebirth. Lions represent strength because physically they are strong, being able to take down prey larger than themselves, such as the water buffalo. Science offers us a greater understanding of our world and therefore a better understanding of the magic we perform. The two cannot be separated, and they shouldn't be. If you have to ignore science to perform magic, you may not be doing anything other than lying to yourself. Many of the correspondences you read in a book are based on science, and it's important you know WHY the correspondences exist if you are going to use them or write your own. 3. Tackle Boxes. Alright, so moving away from literature to more practical everyday objects. I have a lot of tackle boxes. I mean...like 4 or 5. I use them to organize crystals, herbs, and other smaller magical objects I collect, like acorns, petals, insect parts, and feathers. This is a valuable organizational tool for witches, so utilize them. You can purchase some at Dollar Tree, Walmart, or Amazon for next to nothing. In Dollar Tree, they tend to be sold near craft items and school supplies, although you may need to check with a store associate. You don't need "witchy" bottles or chests to organize your supplies. Modern tackle boxes are just as useful. 4. Scrapbook Supplies. I freaking love scrapbooking supplies, and I mean LOVE them. I had to stop going to craft stores because I was buying scrapbooking supplies faster than I could use them. I used to be super into scrapbooking. Now I am super into using my scrapbooking supplies for magical purposes. I use the papers to write spells, using colored papers or patterned papers to enhance the magic. 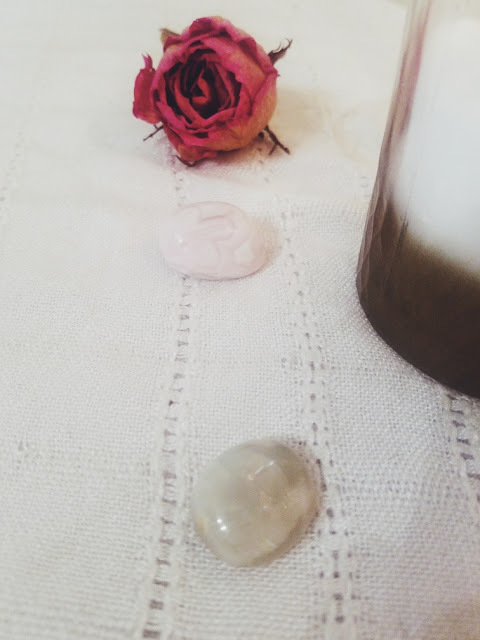 For example, I use green paper for money spells, while rose floral papers get used in love spells. Furthermore, scrapbooking supplies are an excellent way to work with your Grimoire or BOS. You can decorate pages with papers, stickers, stamps, and so much more. Go wild and crazy! Seriously! I find it boring to spend time just writing and drawing. I plan on including many more pages in my Grimoire in the future that incorporate the supplies I already have. It is a great way to fill your magical book with your own power and personal creativity. 5. Calendars. I talked about all my calendars in one of my first posts of the year, so it shouldn't be a surprise they made this list too. From almanacs to personal planners, calendars play a role in helping us keep track of astrological events, major holidays, and our personal lives. They allow us to better plan spells by allowing us to work with the moon cycle, days of the week, or times during the day. Calendars also allow us to plan future spell work so we have everything we need when the time comes. If you are planning an elaborate ritual, you are going to need to set apart time to write the ritual and purchase any items you may not have. I also keep track of my goals, blog posts, hedge riding dates, and sometimes even my dreams. I make constant little notes off to the side in all my planners/calendars. It can be something as simple as how I'm feeling or more complex, like a premonition or omen or synchronicity. Keeping a calendar is like keeping a journal, at least for me. 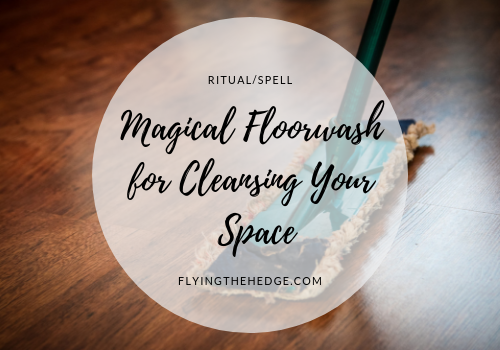 Mine is an integral part of my magic practice, and it should probably play a role in your magic as well. So there you have it! Some may be unfamiliar or shocking, while others you may already be using. Help me add to the list. 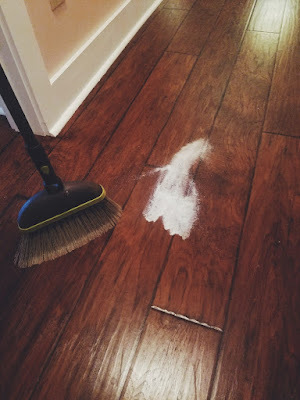 What are some unsuspecting or little mentioned tools you use in your magical practice? 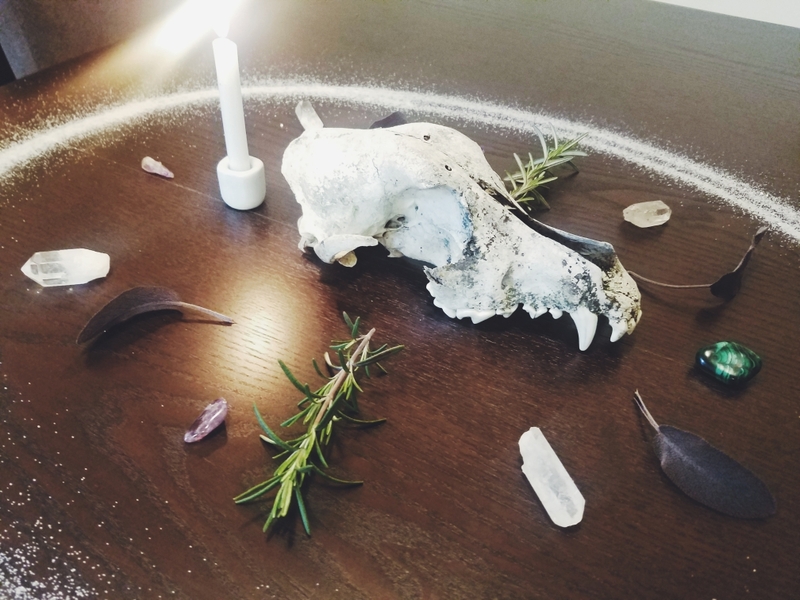 Animal remains have traditionally been used in witchcraft and other magical practices since the dawn of man, whether it be through animal sacrifice, bone divination, spirit summoning, or for protection from evil spirits. Our ancestors had to make do with what they had, which meant animal remains were often used for magical and mundane purposes. 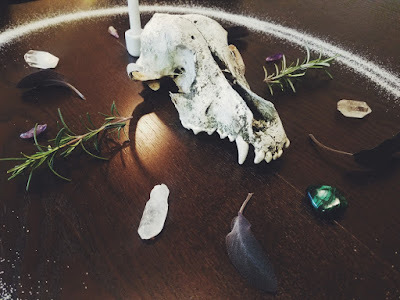 The complete history of animal remains used in magical practices is far too vast to cover in a single article, so my goal here is to cover the basics, specifically animal sacrifice and bone divination. While many other animal parts have been used in a variety of way, these are two are the most important animal remain uses in regards to this series. 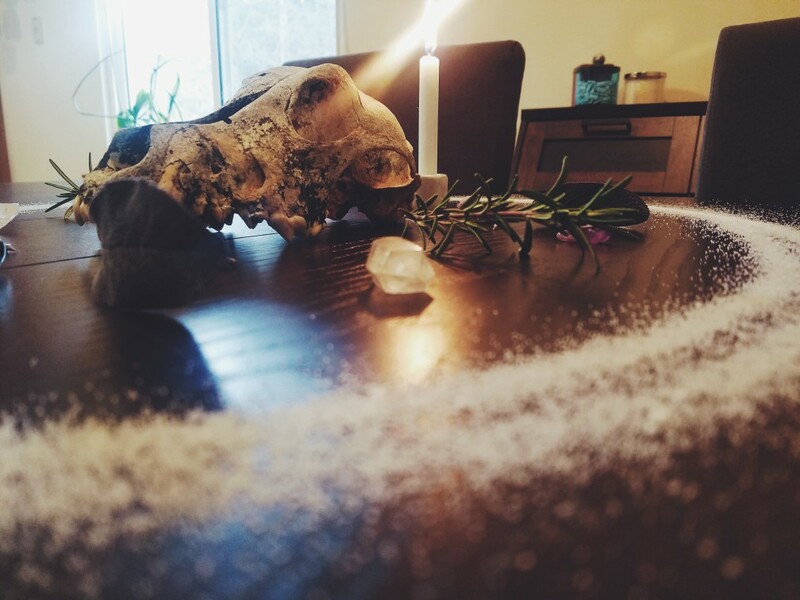 Without a brief history, the use of bones in your magical practice will seem disconnected. Let's get started, shall we? The term sacrifice derives from the Latin sacrificium, which is a combination of the words sacer and facere. Sacer means something set apart from the mundane, while facere means "to make." In other words, sacrifice means to make something secular or profane, specifically for something spiritual or supernatural. Sacrifices can take many forms, one of which includes destroying what you are sacrificing, whether through burning or slaughter. In the case of animal sacrifice, the animal is "liberated" of life which is then made available to the deity. At the time when animal sacrifice was most common throughout cultures around the world, food was scarce, making an animal sacrifice a true sacrifice in that they were giving up perfectly good food that could be the difference between starving or surviving the winter months. There have been a variety of theories as to why animal sacrifice arose, including that by Sir Edward Burnett Tylor in 1871. Tylor proposed sacrifices were originally a gift to the gods to secure favor (source). William Roberston Smith, however, proposed that sacrifices were originally conducted to bring groups of people closer together, as a way for them to commune with each other and their deity (source). Later, Sir James George Frazer, the author of The Golden Bough, suggested sacrifices were performed as a magical ritual in which the slaying of a god was performed as a means of rejuvenating the god (source). Think Oak vs Holly King. Whatever the reason, most people agree that animals were sacrificed as a tribute of some form to a deity for the betterment of the clan or tribe. The earliest known animal sacrifice is from Ancient Egypt, dating between 4400 to 4000 BC. Animal remains, especially of sheep and goats, have been found buried in their own graves, while gazelles and other wild animals have been found buried at the feet of humans, likely as a sacrifice to those who died or as a tribute to bring with them to the afterlife (source). Later, Egyptian animal sacrifice became restricted to livestock, such as sheep, cattle, and pigs, each with set rituals and rules describing how the animal was to be sacrificed (source). 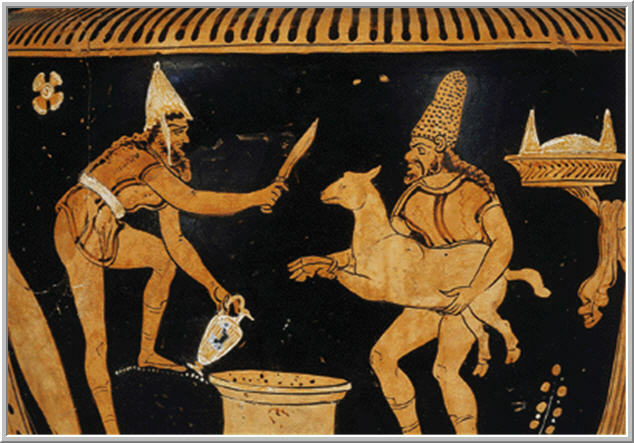 By the end of the Copper Age (3000 BC), animal sacrifice is seen across the world, particularly in Gath, Sardinia, and Crete (source). Many cultures sacrificed the entire animal, but the Greeks tended to eat the edible parts, leaving the remains in honor of the deities. After the animals were sacrificed, the entrails were often read by a haruspex, a person trained in the art of divining from animal entrails known as haruspicy. This tradition is directly derived from Etruscan religion and the method continued well into the Middle Ages. Thomas Becket even partook in the practice, seeking a reader prior to a royal expedition against Britanny (source). According to Walter Burkert, ritual animal sacrifice of livestock may have developed as a continuation of hunting rituals. As humans moved away from hunter-gathers toward agriculture, domesticated animals likely replaced wild animals as tribute (source). As for Anglo-Saxons, the most common animal sacrifice was blót, the term for "sacrifice" in Norse. These sacrifices included livestock and even human prisoners and were made to honor any Norse deity, the spirits of the land, and even the ancestors (source). Animal sacrifice is still practiced today in a variety of cultures, including some forms of Hoodoo and in parts of Africa. In West Africa, the Talensi people have a shrine, Tongnaab Yaane for the deity Tongnaab where animals are still ritually sacrificed today to gain favor for fertility, stability, and prosperity (source). Apart from animal sacrifice, the parts of animals, especially domesticated ones, have been used for divination purposes. As mentioned above haruspicy, the reading of animal entrails was practiced well into the Middle Ages. The practice is first mentioned in the Book of Ezekiel 21:21, "For the king of Babylon standeth at the parting of the way, at the head of two ways, to use divination; he shaketh the arrows to and fro, he inquireth of the teraphim, he looketh in the liver." (source). Babylonian clay models of sheep livers dated between 1900 and 1600 BC suggest animal livers, specifically sheep, were commonly used as a divination tool. The clay models are believed to have also been used during divination by Mesopotamian priests and seers looking for information about a person's illness (source). The most well-known form of animal remains divination is "throwing the bones" or bone divination. 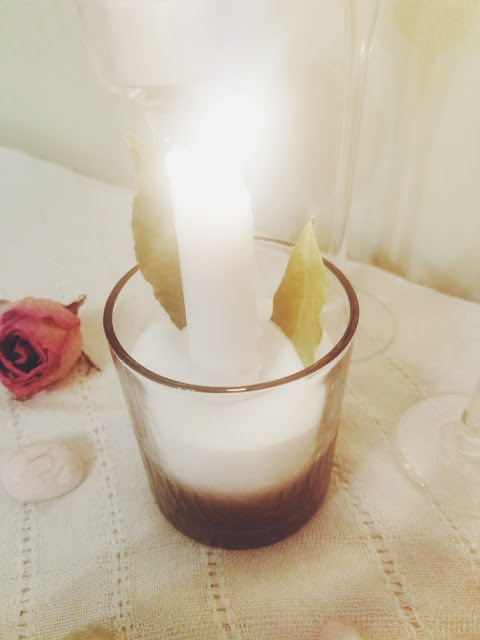 Bone divination, especially scapulimancy and plastromancy, was practiced by cultures around the globe. Plastromancy is the use of turtle shells dor divination while scapulimancy is using the scapula or shoulder-bone of an animal. Oracle bones, as practiced in ancient China during the Shang dynasty, used the plastrons of turtles and the shoulder-bones of pigs and oxen to answer questions regarding future crop planting, weather, military endeavors, and the fortunes of the royal family. 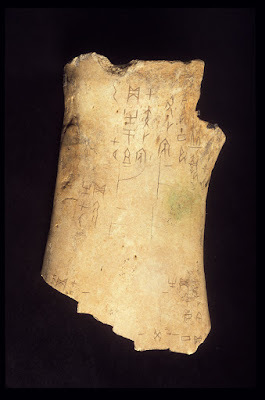 The question was carved into the bone or shell in oracle bone script, a specific language for this type of divination, and then intense heat was added using a metal rod until the bone or shell cracked. 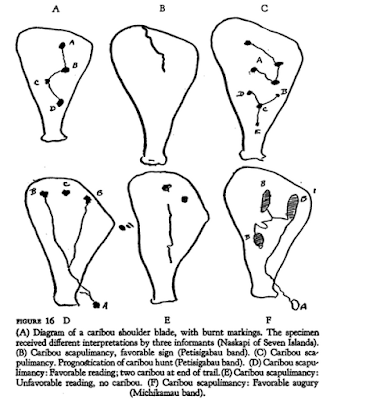 The reader would then read and interpret the crack patterns (source). "A strange habit of these Flemings is that they boil the right shoulder-blade of rams, but not roast them, strip off all the meat and, by examining them, foretell the future and reveal the secrets of events long past. Using these shoulder-blades they have the extraordinary power of being able to divine what is happening far away at this very moment. By looking carefully at the little indents and protuberances, they prophesy with complete confidence periods of peace and outbreaks of war, murders and conflagrations, the infidelities of married people and the welfare of the reigning king, especially his life and death." Things long to come foreshowes, as things don long agone." This passage is very similar to that from Gerald of Wales, both of which describe using a speal bone to divine the future. Other methods have also been recorded, including by peering through the semi-transparent bone as a form of scrying or grinding the bone into a power, dissolving it in water, then drinking the liquid (source). Yuck! This practice of shoulder bone divination as described in the passages above continued through the nineteenth century in Europe. By the mid-nineteenth century, however, the shoulder-bone began being used in love divination to reveal a future spouse or persuade a reluctant lover (source). During the Renaissance, scapulimancy was eventually classified as one of the seven "forbidden arts." (source). Despite the change in European magical circles, scapulimancy continued to flourish among Native American tribes across North America. Like early European and Chinese peoples, Native American tribes, including the Algonkian and Innu, would heat the scapula until cracks formed. 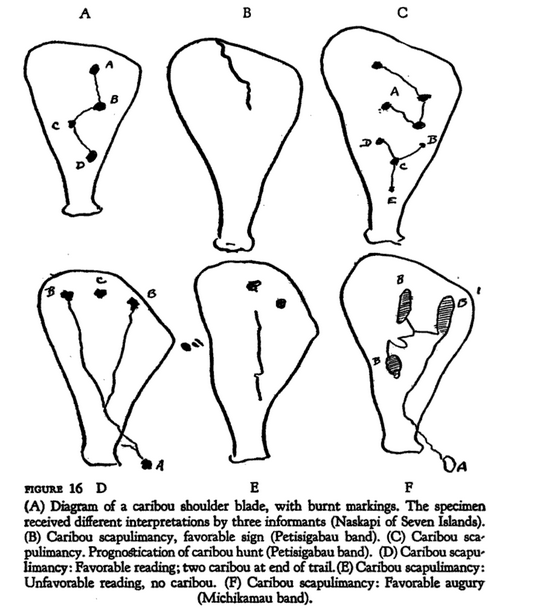 However, they relied heavily on caribou, deer, rabbit, and very seldom sheep scapula's to determine where they should hunt, instead of foretelling their futures, commonly referred to as the "shoulder-blade path" (source, source, source). They also used beaver tibias and bear patellas to determine hunting success while fish mandibles and clavicles were thrown to answer yes (teeth upwards) or no (teeth downwards) questions (source). There are dozens of other bone divination practices used by Native American peoples that survive to this day. I suggest reading through Naskapi: The Savage Hunters of the Labrador Peninsula by F.G. Speck to learn more. Throwing the bones is a more modern Hoodoo practice with traditional roots in African culture, especially among the Zulu, Swazi, Xhosa, and Ndebele traditions in southern Africa. African practices mingled with those of Native American and European to become the tradition we see today. Hoodoo bone divination usually includes chicken or opossum bones mixed with shells, pebbles, dice, or other found objects (source), but I will touch more on this in a later post. While not every witch today uses bones in witchcraft, there is no denying their historical use. 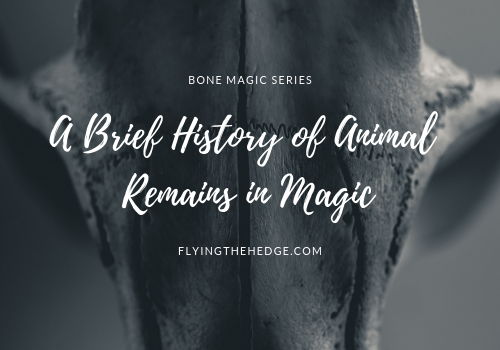 From sacrifices to divination, animal remains have been used by magical practitioners around the globe and for many of us, they still play a crucial role. We use them to work with animal spirits, as a spirit vessel, to summon mythical creatures, incorporate them into ritual jewelry, craft ritual tools, aid us in shapeshifting, divining the future, and even in tinctures! The purpose of this series is to get you started on your journey with working with animal bones and other animal remains in your practice. Again, this is by no means a complete history. Honestly, I didn't even put a dent in the vast amount of research available in books and online, but hopefully, this is enough to pique your interest and garner a better understanding of the topics we will be covering in the future. Until next time! Magical Uses and History: Artemisia absinthium, commonly known as wormwood, derives its name from the goddess Artemis and from the word absinthum meaning "unenjoyable," referring to its bitter taste, as found in the old proverb, "As bitter as wormwood." The common name, wormwood, however, comes from its historic medicinal use of curing intestinal worms. Fun times! 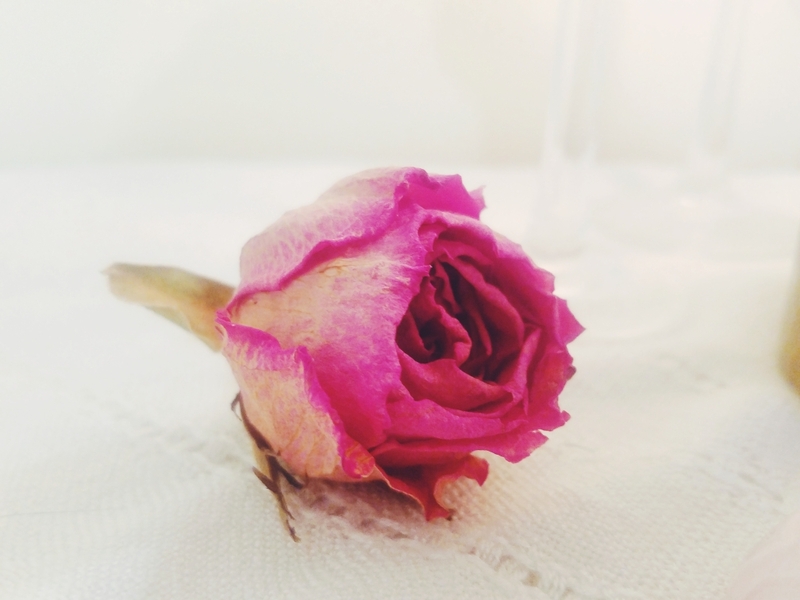 In dreams let me my true-love see." And therefore, to have it, is not in vaine." Today, it can be carried for protection against vengeful spirits, bewitchment, and harm in general, or hung from the rear-view mirror of your car to protect from accidents. Wormwood also has a strong association with snakes, as it is said that it was the first plant to grow from the path of the serpent as it exited the Garden of Eden. According to Culpepper, wormwood could be used to treat snakebites, as well as bee, wasp, and scorpion stings. Wormwood is burned or worn to increase psychic powers or to summon spirits. According to Cunningham, it can be mixed with sandalwood and burned in a graveyard to summon the spirits of the dead. Wormwood is also used as an offering to spirits and can bind them to our realm if you know what you are doing. Medicinal Uses: One of wormwood's common names is green ginger, a name it was given as an allusion to its medicinal properties in common with ginger. Historically, wormwood has been used to treat a host of ailments, many of which have been vindicated through science. Its best use is as a bitter for digestive issues, including indigestion, gas, bloating, and worms, particularly roundworms and pinworms. It can also be used to reduce fevers and fight general infections, the same way ginger can be used. 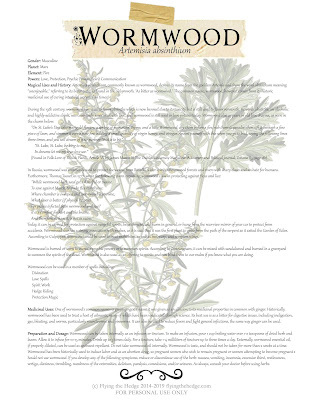 Preparation and Dosage: Wormwood can be taken internally as an infusion or tincture. 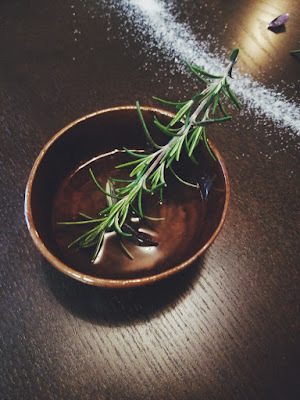 To make an infusion, pour 1 cup boiling water over 1-2 teaspoons of dried herb and leaves. Allow it to infuse for 10-15 minutes. Drink up to 3 times daily. For a tincture, take 1-4 milliliters of tincture up to three times a day. Externally, wormwood essential oil, if properly diluted, can be used as an insect repellant. Do not take wormwood oil internally. Wormwood is toxic, and should not be taken for more than 2 weeks at a time. Wormwood has been historically used to induce labor and as an abortion drug, so pregnant women who wish to remain pregnant or women attempting to become pregnant should not use wormwood. If you develop any of the following symptoms, reduce or discontinue use of the herb: nausea, vomiting, insomnia, excessive thirst, restlessness, vertigo, dizziness, trembling, numbness of the extremities, delirium, paralysis, convulsions, and/or seizures. As always, consult your doctor before using herbs. 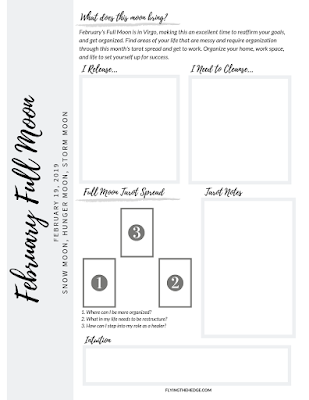 This month's full moon is on the 19th and if you are trying to plan a magical year, what better way to help you get started than this full moon worksheet specifically designed for the upcoming Snow Moon? 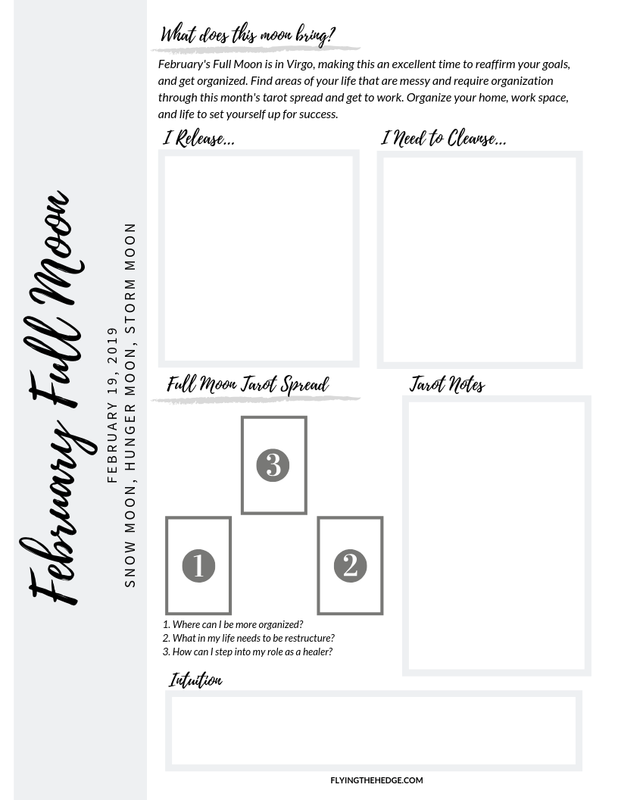 It has everything you need to conduct your very own short ritual, including what this moon is bringing, sections to write down what you intend to release and cleanse, a tarot spread with a place for your notes, and any thoughts or intuition you receive while communing with the moon through meditation or hedge riding! 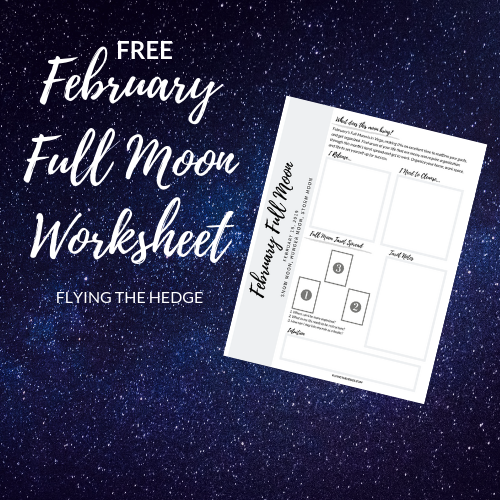 This worksheet is completely free and can be easily printing and added to your Book of Shadows!